Almost all of use are bathroom singers. Lol :D, but that's the truth of our life. We all like to sing while bathing. It's comes under one of the most common thing of the world. Song people like to sing with the voice of the song while some of them with the beat. But you'll be able to sing on a karaoke track (The music is typically a well-known popular song minus the lead vocal. Lyrics are usually displayed on a video screen, along with a moving symbol, changing color, or music video images, to guide the singer) or a instrumental ring-tone only when vocals won't be present there in the song. 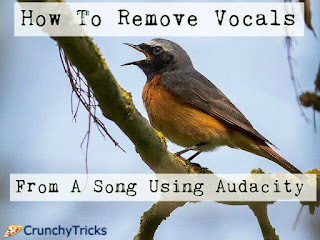 So today in this guide I am going to elaborate how you can remove vocals from a song/mp3 completely using open source software audacity. Note: - You won't be able to get rid from vocals of all songs. You can't remove vocals from each and every mp3 using this software rather if you need a quick vocal removal then it's for you. This open source tool will give best result with the stereo tracks. Audacity is an open source free-ware multi-track audio editor and recorder for Windows, Mac and Linux operating system. It has literally awesome features, some of them I have listed below. Download latest version of Audacity from here if you're not having till yet. Install it on your system and click on it open. It will load on its own in the audacity. After that navigate to Effect> Vocal Remover (for center-panned vocals) and click on it. A new window will pop up simply click on OK button with the default settings. That's it, you'll get a song with removed vocals. To save your file navigate to File>Export Audio. If you're facing error with Simple (entire spectrum) then simply select Remove frequency band or Retain frequency band from "Removal choice". Also you can change frequency band limit. So this was all about how to remove vocals from a mp3 using free-ware audacity. This was the simplest method to remove vocals. Although you can't remove voice from all the songs only so try your luck. You can get best result for stereo songs. If you've any doubt or query then feel free to leave a comment below in the comment section.